The first edition of "Integrated weed management in Australian Cropping systems" was published in 2006. This manual was a world first and it broke new ground in the fight again st herbicide resistance. This manual was a huge collaboration under the umbrella of the CRC for Australian Weed Management. The GRDC saw the value in the project and helped fund the development and printing of the manual. Eight years later the revised manual is available online at the GRDC. While it follows the same structure as the first edition it has some new sections and different emphasis. There are now 23 weed profiles with the addition of fumitory (Fumaria spp. ), feathertop Rhodes grass (Chloris virgata) and windmill grass (Chloris truncata). Brome grass is one of the two “weeds-to-watch” for southern farmers. The other is wild radish in its many combinations of herbicide resistance. Brome grass swamping a fire break - a great source of weedsI talk about brome grass and not rigid or great brome, as I do not know anyone who can tell them apart in the paddock. In a lab under a binocular microscope, it is possible. For management purposes they should be considered the same species. Brome grass is on the increase with the increase in minimum tillage because of limited availability of effective in-crop herbicides, delayed germinations and an ever expanding spread of herbicide resistant populations, particularly to Groups A and B. There are now 3 populations of brome identified resistant to glyphosate – two in South Australia and one from the Victorian Mallee. The other problem is its ability to shatter. I passed a barley paddock near Kojonup, Western Australia, in late November which had a massive infestation of brome grass visible. When I passed the same crop two weeks later, most of the brome seed had dropped to the ground (see below). For harvest weed seed management to work here, the barley should have been harvested as soon as it was ripe. Now you see it, now you don't - heavily infested barley crop where brome has shed after two weeks.Follow the link below to read a comprehensive interview with Chris Preston, University of Adelaide, regarding management of brome grass. 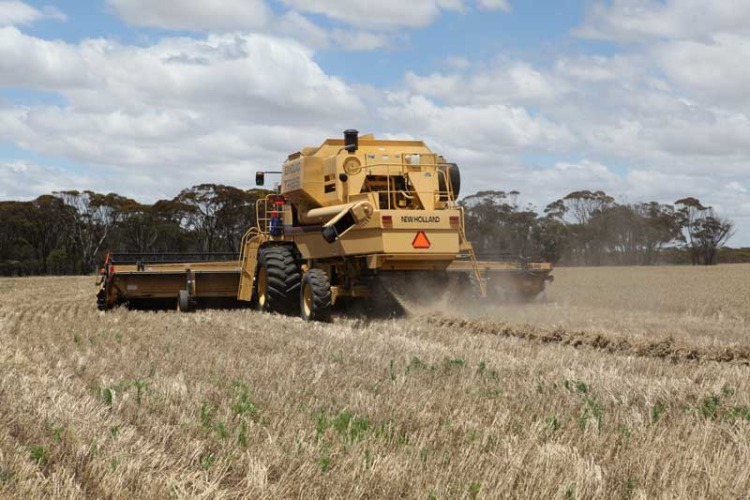 The Grains Research & Development Corporation have just released a series of succinct videos on producing and burning narrow windrows. While set around Geraldton the principles apply everywhere. For a more southern Australian experience see what Doug Smith has been doing at Pingrup in southern Western Australia. Doug's header harvest at 15 cm to produce a tight narrow windrow Doug with his cheap to make and hard to block shute.